Instructions with photos follow, printable directions at the end of this post! 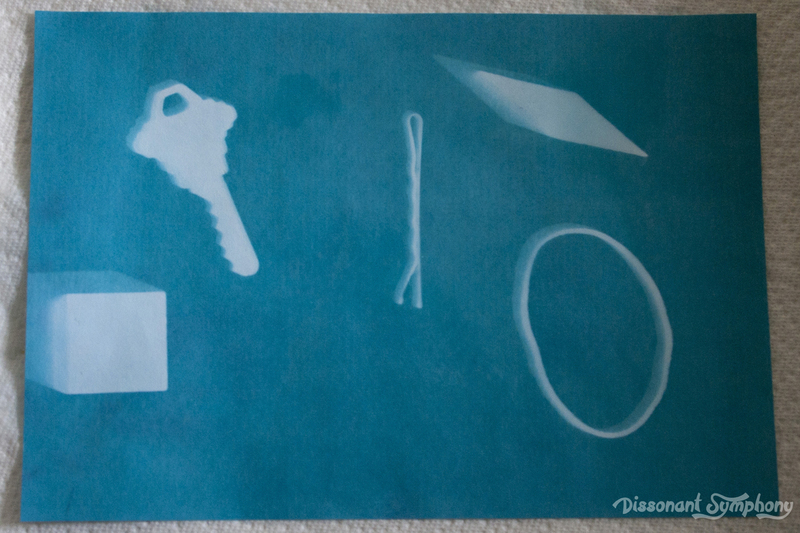 Arrange your objects on a piece of sunprint paper out of the reach of the sun. This is very important. The blue molecules embedded in the paper are super sensitive to ultra-violet light. 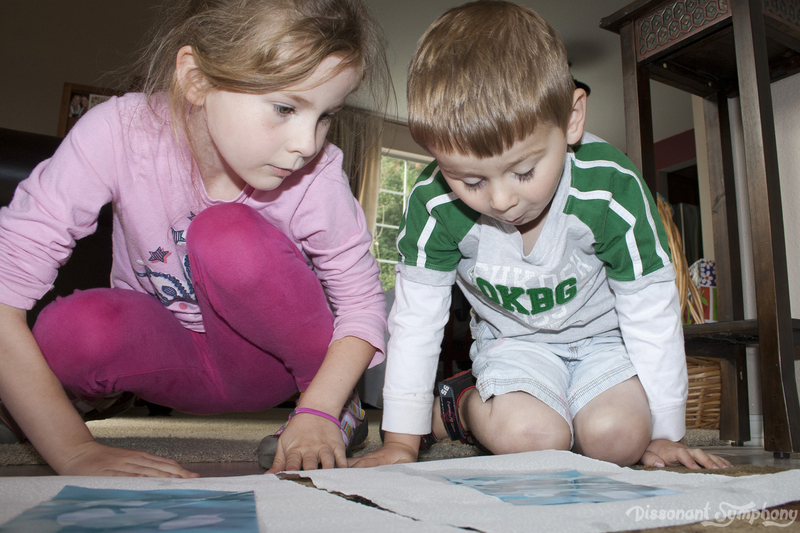 Any sunlight will expose the paper quickly, but even ambient light in the shade or in a room with a big window will begin exposing the paper. 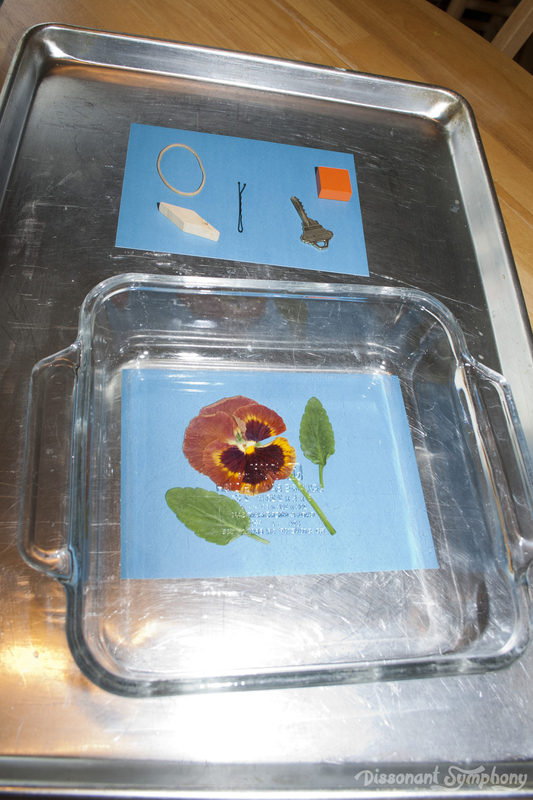 Place the acrylic sheet on top to flatten and hold your items to the sunprint paper. Note that my kids wanted to use some items that weren’t flat (read, couldn’t be pressed)…super fuzzy edges on those. I’ll probably do this again over the summer and take a nature walk to find better plants to print. There’s my casserole dish pressing down on the flowers. Just looking at this picture makes me feel super lame. The sunlight will find its way underneath the edges of your objects if they aren’t pressed firmly to the paper…as you’ll see in a little bit. For best results, find things that are flat with distinct edges. Ferns work great. Take your sunprint outside and lay it in direct sun light for 2-5 minutes. The areas of the paper exposed to the sun will fade from blue to white. When you see most of the color disappear from the paper, your print has been fully exposed. If no direct sunlight is available, don’t worry—just expose your print a little longer and wait for the same fading effect. Under cloud cover, the process will take 5-20 minutes depending on the thickness of the clouds. Rinse your sunprint in water. Watch the white turn into blue and the blue turn into white. 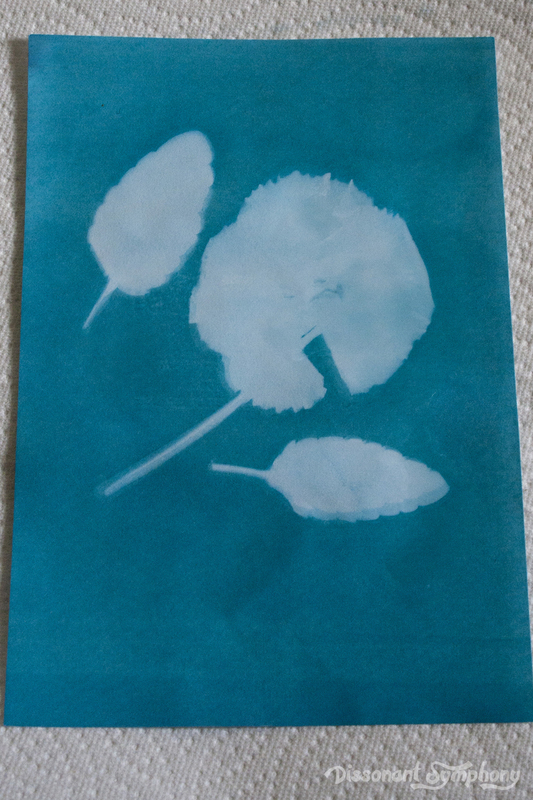 To get the deepest blue that the paper can give, leave it in the water for a while: 1-5 minutes. There are two exciting things happening underwater. First, the original blue compound is water-soluble so that when you immerse it in the bath, the water carries it away, leaving only the white paper base in those areas. Second, the colorless compound whose formation was caused by the sun’s energy is not water-soluble, so it cannot wash away in the water bath. It is sensitive to the water in another way. Just as the Sun’s light stimulated a chemical change in the previous step, the water stimulates another chemical change. The water causes an oxidation reaction that turns the colorless compound into the deep blue of a finished sunprint. 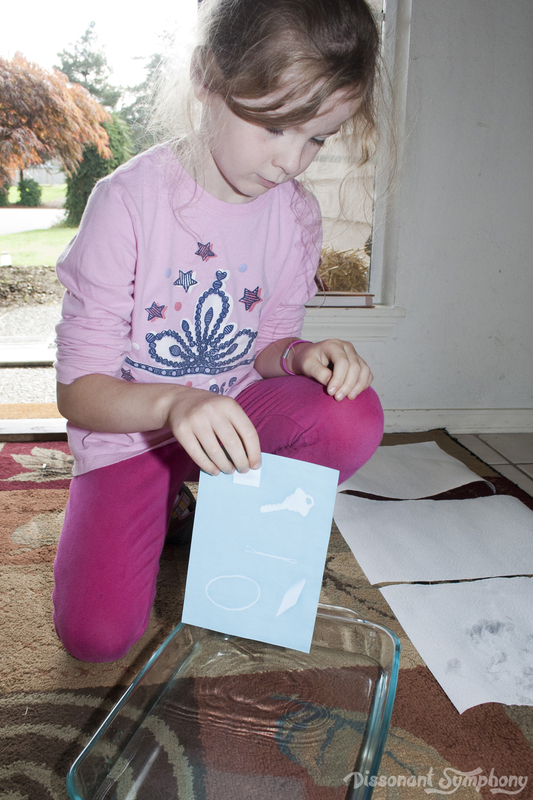 Lay your sunprint flat on an absorbent surface and allow it to dry. You can use a paper towel, or a piece of cardboard as a bed for your sunprint while it dries. Putting it on something absorbent helps to avoid the formation of water spots by drawing the water from the sunprint paper. 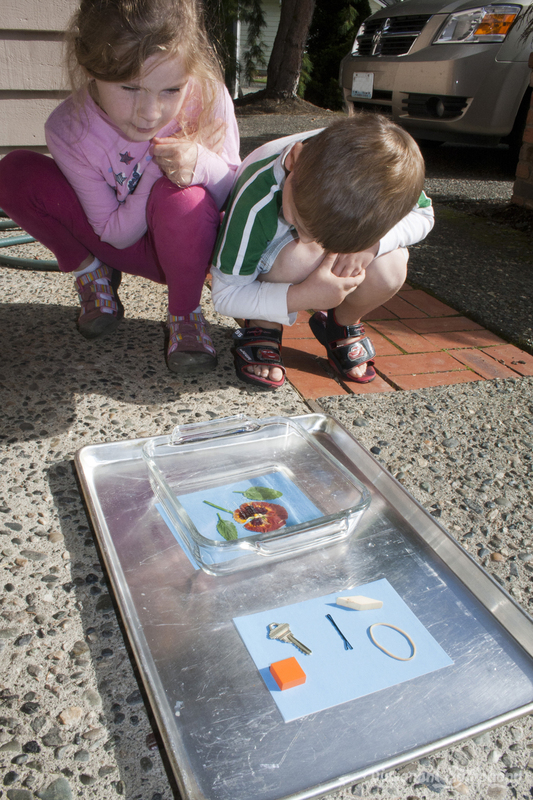 This step seemed like watching paint dry to me, but it kept my kids occupied until the last remnants of water had evaporated. I’m all for low maintenance baby-sitting. When you take your paper out of the water, it will probably not have finished oxidizing. 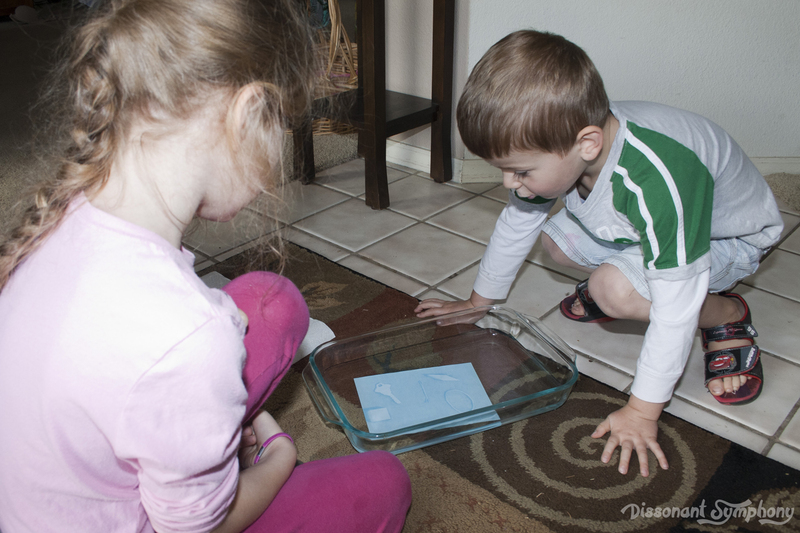 The water remaining in the paper will do the job before it evaporates. By the time it is all gone you should have a beautiful deep blue sunprint! 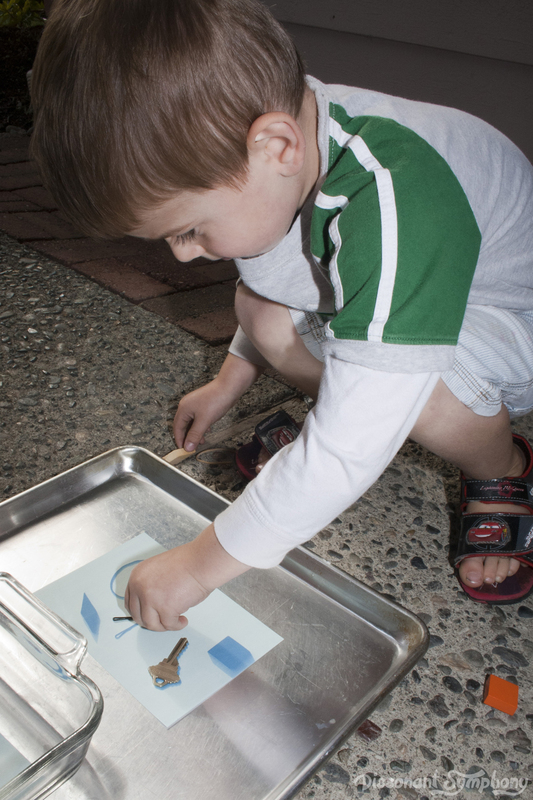 Enjoy making sunprints the next time it’s gloriously sunshine-y outside!